Berlin Inter-Community Ambulance Association (Berlin EMS) provides Emergency Medical Services for the residents, businesses, and visitors of Berlin Borough, NJ (08009) and Berlin Township, NJ (08091). Berlin Borough and Berlin Township has State, County, Local Roadways and The Gamblers Express Train operated by NJ Transit that travels from Philadelphia, PA to Atlantic City, NJ through its response area. Berlin EMS provides 1 ambulance staffed by New Jersey Office of Emergency Medical Service certified Emergency Medical Technicians 24 hours a day. Our 2nd ambulance is on a recall basis. Berlin EMS has a MCI unit that is equipped to handle 50 plus patients if needed. This unit currently is on the Camden County MCI plan for regional deployment or requested by OIC of a incident. Our department was dispatched to a total of 2307 emergency calls in 2014. There were 1172 in Berlin Borough, 727 in Berlin Township and an additional 408 calls for mutual assistance to the surrounding communities. Over the past year we continued to maintain a roster of four volunteer EMT’s and two Junior members. During 2014 we took part in many community activities including Fire prevention nights in Berlin Borough and Berlin Township, Home Depots safety day, the July 4th parade and fireworks, Berlin Borough and Berlin Township Christmas parades, Community days and Memorial Day events. We also assisted the Zone 4 Police Tactical Team on several standbys when requested, and staffed a standby crew for the Maccabi Games and annual Tour de Shore bike ride. We continued our “Helmets for Safety” program along the Berlin Borough and Berlin Township Police departments with donations from our friends at “Rita’s Water Ice”. On behalf of our members we would like to thank our residents and businesses who helped support us again this past year by donating to our annual fund drive campaign. Your tax deductible donations are used to cover items such as uniforms and training. Our Department also offers CPR training, Ambulance and Building tours for our residents, businesses and local youth groups, please visit BERLINEMS.COM for additional information about our department. 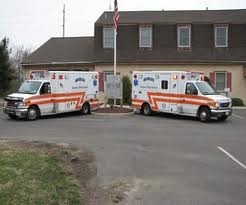 As we move into 2012 we continue to strive to provide our residents with the best pre-hospital care available.